This week Wwarhammer Tau is going to show you how not to play Tau in Warhammer 40K. My Warhammer Tau army took a real beating this week and it was all my fault. 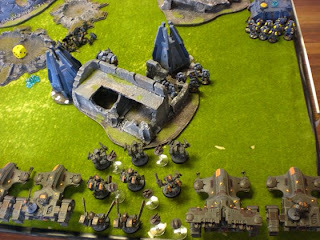 I took another trip to the Essex Warhounds club in Hockley and played a chap named Nathan who had a Space Wolves army. As I'm in the process of building my own Space Wolves force, I thought it would be a great opportunity to play an experienced Space Wolves player, see which units he is fielding and how effective they were in Warhammer 40K 5th edition. But what I didn't expect was to accidentally leave my brain at home and play my Tau army like a complete moron! I let him bait me with a Rhino full of Blood Claws and deployed my entire army in the corner to engage it. Soon I was penned in by a Venerable Dreadnought and a Grey Hunters squad which had arrived by drop pod. Instead of moving away and shooting like crazy, I advanced, all guns blazing. Typically, I didn't kill much, then spent the next few turns losing units as I made a very hasty retreat as more drop pods came down and his Predators shot my from across the table. My lack of movement was all because of his Wolf Scouts who could come on from my own table edge. So I huddled in the corner...and died in the corner with nowhere to run. Of course, it was only during the course of the game that I realised he couldn't charge my infantry units that were lined up against the back of the board, because Wolf Scouts can't move within 1" of an enemy unit during their Movement Phase. Like I say, I'd left my brain at home. He tried a conga line to move 6" on to the board between two units, but as he had 7 models in the unit, couldn't get them all on. So he came on around the side of a Devilfish and blew that up isntead, which was fair enough. In hindsight I should have advanced everything into the middle, where I'd have plenty of room to move around the shoot things or lined up along the back edge, spread things out or just kept it all in reserve. It seems quite a common occurence that I will face an army I'm not used to, completely fluff my deployment and lose badly. I'll face it again and half of the time do alright, half of the time still lose, but play better. It's only on the third encounter I seem to crack it. This seems to be a predominantly Tau army problem, because the army is so technical to play. So keep playing, keep learning and when you've played 3 games against all the different army types you'll be king! Its true, tactics are needed in this game, Oh how I love winning games mainly due to my opponent having no reasoning or very pathetic reasoning to moving his troops in one direction and so on. Well, getting beat or no, I appreciate the running updates. I am BRAND NEW to 40k and started with Tau, so I am learning TONS whether you win or lose :-) You keep making my mistakes for me so I can hit the ground running. stay tuned for this friday's article then! Interesting that he has a rhino of marines. I play Wolves as well and I frequently find it annoying that for us if drop pods are involved then the only things we can take are Dread.s, marines, termies, scouts and speeders. That means no rhinos or predators at all. I think you may want to look in to that. I, too thank you for the battle reports. As I told a newbie to 40K I met the other day as he was buying his first army... Tau, about your blog. So, I think your followers shall grow again. As for your game against the space puppies, yes I call them that as my best friend has played them since he started playing and it annoys him so, Scouts that can show up on your side with at least 2 plasma weapons hurt. Believe me, I have been there with my Tau and my Orks. Against drop pod armies, space wolves or anything like it, it is a standard Fritz tactic to reserve everything. It works, i've tried it with Tau. Our mobile forces are really suitred for this style of play. Always leave yourself an escape route as well.